I was born and raised in the decisively uninspiring land (to a climber anyway) of Indiana. However, at the age of 19 I moved to Gunnison, Colorado to pursue dreams of mountain adventures and abundant wild spaces. 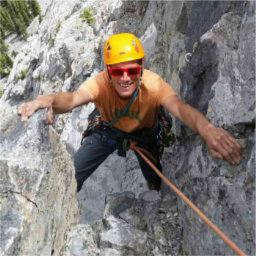 During that time I was introduced to the world of rock climbing and since have been captivated by the improvisational and fluid movement that rock climbing demands. It is not just the movement of climbing that has captured me but also the mindful and solitary space one finds themselves in while delicately clinging to the face of a wall or jamming their hands in a crack. For me, climbing has always been more of a personal investigation into the human condition rather than a triumph of one's physical prowess. For this reason, I have never taken climbing competitively. In terms of climbing indoors, I have worked at three climbing walls over the course of six years and have been a member of the Spirit Rock team since October 2017. With that experience in mind I can honestly say that Spirit Rock is my favorite climbing wall I've ever been a part of. Not only does Spirit Rock have a very welcoming, nonchalant energy, it also has a unique floor design that allows for a lot of variety when it comes to climbing style (e.g. overhang, vertical, slab, bouldering). However, what I most respect about Spirit Rock are the three owners; Ryan Tarves, Kevin Blades, and James Gray. Their unrivaled commitment to the community, the facility, and their team members serves as the proverbial glue that holds everything together. While Spirit Rock is a great place to rock climb, perhaps its chief significance is the space it provides for adults and children alike, local or non-local, to connect and interact with one another.